Observation wheels are all the rage right now, and why not? You get to embrace your childhood memories while all the while enjoying a new perspective on the city in which you are staying. For some really great experiences that you don’t want to miss, here are five wheels to check out. 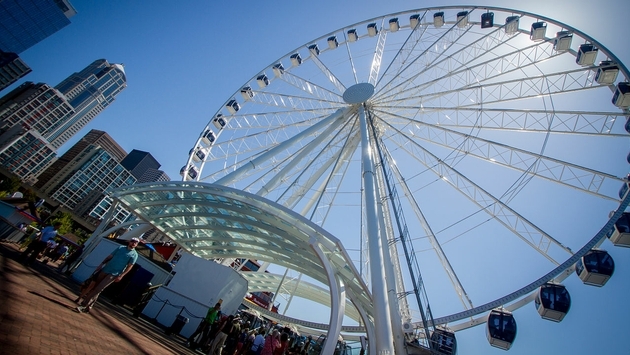 Pier 57 in Elliott Bay is home to the Seattle Great Wheel which, standing at 175 feet tall, is the tallest Ferris wheel on the west coast. The wheel itself has 42 fully-enclosed and climate controlled gondolas and actually hangs above the bay at the end of the pier over 40 feet. You can put eight people in each gondola except for the VIP unit. That gondola can only carry four people, making for a serene, intimate ride. 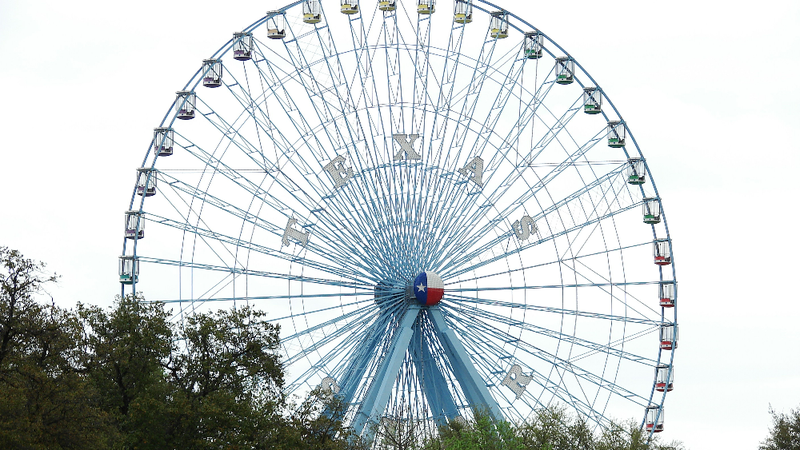 Opening in 1985, the 212-foot-tall Texas Star was the tallest Ferris wheel in the country until 2013. It can hold up to 264 passengers at a time and is opening only during the Texas State Fair. Originally Illuminated by 16,000 incandescent bulbs, the lights were changed out in 2008 for more energy efficient LEDs. To make one revolution around takes about 40 seconds and you can clearly see Fort Worth (more than 40 miles away) from the top. 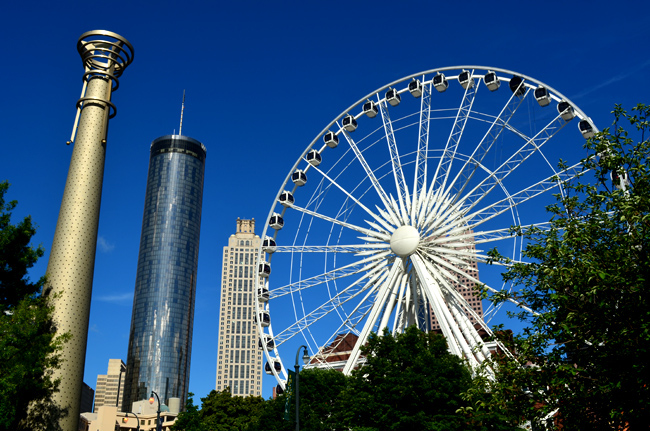 Centennial Olympic Park received a new attraction in July of 2013 with the 200-foot-tall SkyView Observation Wheel. They put six people into each gondola and they are climate controlled so you can ride year round. 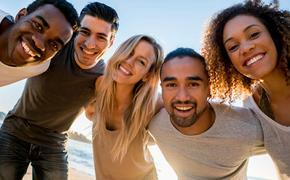 For a special experience, take four of your friends and get into their VIP experience which includes Ferrari leather seats, a glass bottom gondola, a longer ride and no waiting in lines. They are open 365 days a year both night and day, but the sunsets are pretty great here. 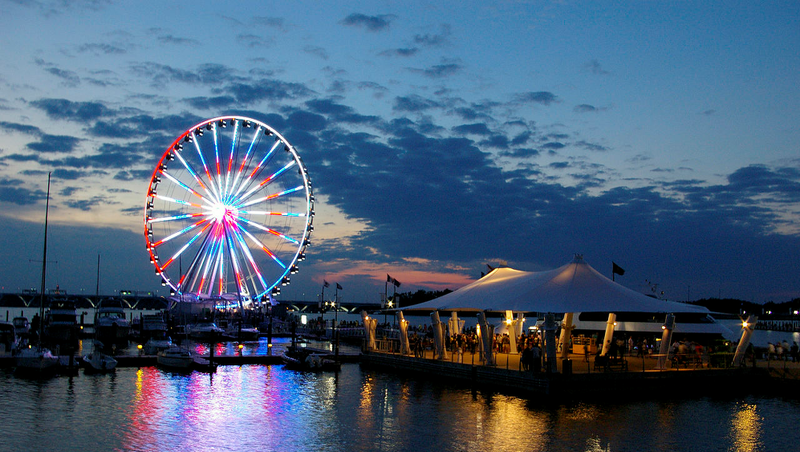 In National Harbor, Maryland, just outside of Washington D.C., lies one of your best places to observe the nation’s capital. With an overall height of 180 feet, each gondola holds eight people and is climate controlled. If you can’t get to take a ride, at least look out for the wheel at night. The 1.6 million LED lights, with a spectrum of 16,387,064 colors make for a show you don’t want to miss. 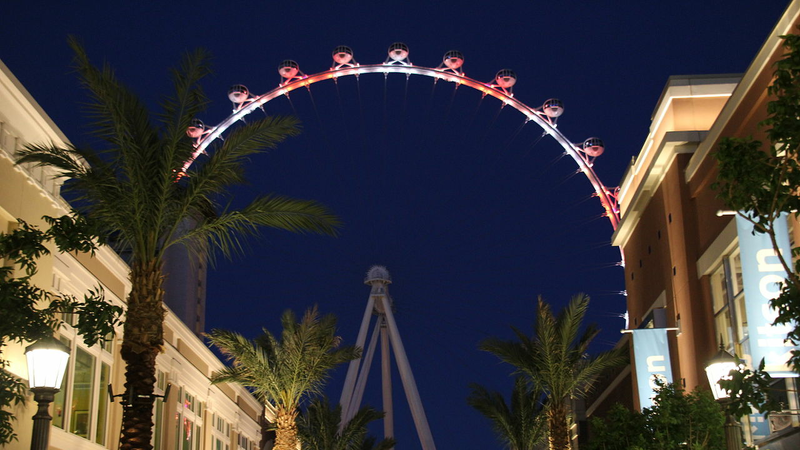 The largest Ferris wheel in the world right now is the High Roller in Las Vegas. Owned by Caesar’s Entertainment and the anchor of their new venue, the Linq. It has 28 cabins and each one can hold up to 40 passengers. It is a whopping 550 feet tall and gives you one heck of view no matter what time of day or night you are taking a ride. They even offer up a special for happy hour, called Happy Half Hour where you get to ride the wheel for 30 minutes and they have open bar right in the cabin. Alright, five great views in five great places around the country. Where is your favorite wheel? Let me know in the comments below.